UP to 250 bundles a week are being listed through the FAB Bundle website since its first live auction in December 20l3, reports the company which says it has seen growing inter­est from bodyshops, salvage agents, exporters, vehicle dis­mantlers, and reconditioners from across Europe and as far afield as Russia. Auctions in January saw almost 250 bundles -typically 12 or 13 dismantled car, LCV or other vehicle parts -weekly on offer. FAB Bundle says that this progress means it could sell more than 50,000 parts during its first year. "I knew there was an appe­tite for bulk parts here in the UK, but am surprised at the interest from Europe and fur­ther afield," says FAB Bundle managing director Jason Cross. "There is significant interest from vehicle dismantlers, that now appreciate the fact they can make a very healthy margin by purchasing bulk recycled parts and not cars -and can buy what they need when they need it, professionally disman­tled and then delivered door-­to-door. " FAB Bundle supplies from vehicles aged 12 years or less, at wholesale prices. To ensure traceability, only approved partner, licensed vehicle dis­mantlers are allowed to sell bundles, and all listings are per­sonally screened and approved by FAB Bundle staff before they go to auction. Each partner is also checked and approved by FAB Bun­dle's customer services team to make sure they are adhering to FAB's policies on vehicle dis­mantling processes. Approved partners upload images and a vehicle description to one of 12 categories. Buyers have seven days from the auction start date to complete a deal. Trade buyers are required to pay an annual registration fee, and once approved, can bid for one or more bundles. Meanwhile Gloucestershire­ based FAB Recycling has been shortlisted for Best New Prod­uct or Service in this year's prestigious Fleet News Awards 2014 for its My Green Fleet business. My Green Fleet is targeted at public and private sector fleet managers. It began recy­cling parts for police and emer­gency vehicles in 2010 and says it has saved 40 police forces £2million in the past 18 months. The service is now expanding into the private sec­tor and insurance markets. "The Fleet News Awards are very prestigious and being shortlisted is a huge endorse­ment for My Green Fleet," says Cross. 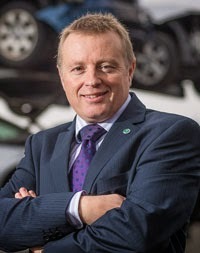 "We believe we have a good chance of winning due to the fantastic support and rec­ognition we are gaining inside public and private sector fleet vehicle organisations, enabling significant savings with the use of traceable, recycled vehicle parts."